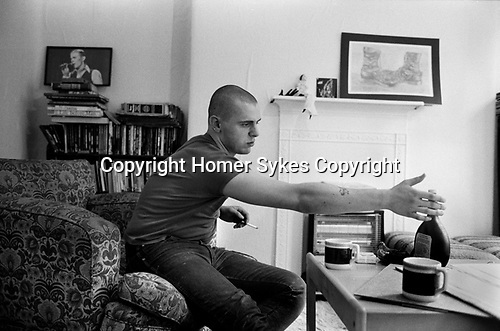 Skinhead Jimmy John ( 19yrs ) 1980 at home in Tower Hamlets east London Uk. He had a French girl friend and is drinking Mateus rose wine very popular at the time. The drawing on the mantle is by him. He worked as a hospital refuse porter at Royal London Hospital Whitechapel. Ex punk, ex rocker, not a member of the NF, he carries a knife.